This post is dedicated to all fans of Hello Kitty in the world. Eva Airline is the first airline from Taiwan, launches the Hello Kitty themed airline service from the moment the passengers purchase air tickets at the Hello Kitty pink kiosks to the moment of checking in at the departure gate. 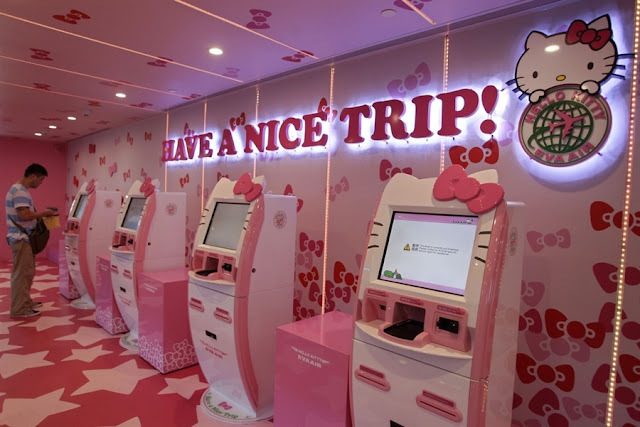 The passengers get the opportunity to experience the real Hello Kitty services during boarding the flights. They can find Hello Kitty images at every corner on the flight, from the food, headrest covers, pillows and even the toiletries. Currently, Eva Airline is flying from Taipei in Taiwan to some popular destinations such as Shanghai in China, Tokyo, Fukuoka and Sapporo in Japan, Seoul in South Korea, Hong Kong and Guam with different themes of the Hello Kitty airplanes. I wish Eva Airline will increase more international routes with Hello Kitty airplanes and to provide more opportunities for the fans (including myself) to fly with Hello Kitty. For more information about the ticket booking and the routes of Hello Kitty Eva Air, please visit this official website here. Hello Kitty motifs, in Taoyuan International Airport, northern Taiwan, April 30, 2012. Forget the YouTube videos. If you want a real dose of cute cat, book a flight with Taiwan airline EVA Air. The carrier has recently added two more Hello Kitty-themed aircraft [Chinese language] to its fleet, taking the total to five, on which everything from the fuselage to the flight attendants to the food is kitted out in the kawaii cat brand's images. The fourth was launched in May and the fifth will launch on June 22 this year. "The passengers over the world love the Hello Kitty jets since launched -- All the Hello Kitty jets have over 85 to 90 percent occupancy," said Liwen Liu, public relations officer of Evergreen Group, parent company of EVA Airways. "Therefore, EVA Airways dicussed further with Sanrio and decided to launch two more planes so we can fly more routes and entertain more passengers." Passengers have been purring with delight, according to Anna Wong, an EVA Air public relations officer in Hong Kong. EVA Air's Happy Music Time Hello Kitty jet. Obviously. "Many people specify that they want to take EVA's special Hello Kitty jet," said Wong. "The response has been excellent so far." This isn't the first time Taiwan's second-largest carrier and Japan's comic company, Sanrio, which owns the Hello Kitty brand, have collaborated. The two companies launched the first generation of Hello Kitty jets in 2005. That Kitty fleet was disbanded in 2009, after its licensing agreement expired. No matter how cute her smile, it can't compete with her apron. The new Taipei-based Hello Kitty jets -- following the themes of Hello Kitty Happy Music Time and Hello Kitty Speed Puff -- will join the three existing Hello Kitty jet family members and will operate on different routes originating from Taipei. The Happy Music Time jet flies to Sapporo and Guam, as does the Magic jet. Speed Puff flies to Hong Kong. Apple Jet flies to Seoul and Fukuoka. Global Jet serves Hong Kong and Tokyo. To book, passengers need to check for specific flight codes. See the bottom of this article for details. The world's cutest boarding passes and baggage stickers. The Hello Kitty journey starts with Hello Kitty boarding passes and baggage stickers. Then passengers make their way to a you-can't-miss-it gate dedicated to the Hello Kitty flyer. The boarding gate in Taipei's Taoyuan International Airport is pink and features a Hello Kitty playground. The only aircraft from which you might be tempted to steal the headrest cover. On board, more than 100 in-flight items are specially designed with the Hello Kitty motif -- including headrest covers, tissues, paper cups, utensils, milk bottles, snacks, soap dispensers, hand lotion, meals and ice cream. Whatever the dish, fliers get a small piece of Hello Kitty. Passengers can also purchase limited edition duty-free products, such as Hello Kitty-shaped pasta, from flight attendants wearing Hello Kitty aprons. A dedicated website (in Chinese, Korean and Japanese only) features Kitty White -- Hello Kitty's "real" name -- from which we learn that Hello Kitty weighs as much as three apples and is as tall as five apples. Even the toiletries are adorable. EVA Air has been operating for more than two decades with a mixed fleet of Airbus, Boeing and McDonnell Douglas aircraft. The Hello Kitty theme can be found on the carrier's new Airbus A330-300s. Each of the new aircraft provides 30 premium laurel class seats (EVA's business class) and 279 economy class seats. How to make airplane food palatable. There are some interesting points on this article however I don’t know if I see all of them heart to heart. There’s some validity however I will take hold an opinion until I look into it further. Good article , thanks and we want more!